Colter & Peterson’s President and CEO assures buyers that an auction website is no place to buy a heavy duty paper cutting system. That's why the creator of PaperCutters.com launched CutterMart, a safe place to buy used paper cutters and paper handling equipment that protects customer investments. West Caldwell, NJ, March 07, 2019 --(PR.com)-- While an auction website is a great place to buy everything from clothing to power tools, Colter & Peterson’s President and CEO assures buyers that it is no place to buy a heavy duty paper cutting system. That’s why Bruce Peterson, creator of PaperCutters.com, launched CutterMart, a safe place to buy certified used or reconditioned paper cutters and paper handling equipment at a discount. CutterMart features the largest selection of used paper cutting machines and paper handling equipment for sale in the world. Every machine must pass rigid tests and standards before earning their Certified Used or Reconditioned stamp of approval. “I’ve heard of people buying industrial paper cutters over the Internet from unknown sellers. To that I say, buyer beware,” says Peterson. “Some may work and some may not, and there is the added cost when it breaks down. That’s why we have CutterMart. Our program, which is accessed through our website, offers customers across-the-board assurance whether they are buying a new product, one that we have rebuilt or one that is Certified Used. Colter & Peterson has provided exceptional customer care for nearly a century. Colter & Peterson’s industry-leading PRISM® and SABER® paper cutter lines are extremely popular and feature Microcut® electronics packages that bring new life to old paper cutters. CutterMart offers hundreds of machines in stock. 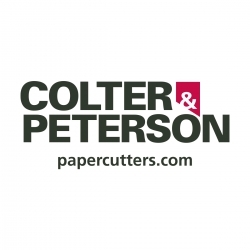 Colter & Peterson is North America’s largest independent distributor of paper cutters and paper handling equipment. Founded in 1932, C&P employs approximately 40 people working coast-to-coast from four locations in New Jersey, Iowa and California. C&P is the manufacturer of the Microcut line of retrofit back gauge controllers and the worldwide distributor of PRISM and SABER paper cutters, as well as C&P and Schneider Engineering Peripheral equipment. The company also is the North American distributor of the CHM precision sheeter and Accutrim three knife trimmers. In addition, C&P provides service and support for the Harris-Seybold, Dexter-Lawson, Challenge, Polar and Wohlenberg paper cutter lines. For more information, call (800) 932-0780 or visit www.papercutters.com.